In a decision issued by Justice Jagot in the Federal Court of Australia, Sanofi-Aventis has been handed what seems to amount to an effective 10-year extension on its patent monopoly for the pharmaceutical compound leflunomide, which it markets in Australia under the names ARAVA and ARABLOC. Briefly, Sanofi-Aventis had an Australian patent on the compound, which expired in 2004. This, of course, enabled it to prevent the supply of leflunomide for any purpose during the life of the compound patent. The approved purposes for which the drug is registered for use relate to the treatment of rheumatoid and psoriatic arthritis. But Sanofi-Aventis also has a patent covering a subsequent medical use of the drug, not envisaged in the original patent, namely in the treatment of the skin condition psoriasis. Until 2014, when this further patent expires, Sanofi-Aventis therefore has a monopoly on the use of leflunomide for the treatment of psoriasis. However, the drug is not currently approved in Australia for this purpose. Based on the above description of the present circumstances, you might think that a generic manufacturer, such as Apotex, would now have the right to market a competing leflunomide product for the purposes covered by the existing approvals, i.e. treatment of rheumatoid and psoriatic arthritis. According to the Federal Court, however, you would be wrong. Justice Jagot has found – generously (to Sanofi-Aventis) – that Apotex’s proposed supply of a generic leflunomide product for the treatment of arthritis would infringe the psoriasis treatment patent, and that Sanofi-Aventis is thus entitled to an injunction preventing such supply. It is difficult to see how this decision does not effectively ‘evergreen’ the compound patent, making the supply of leflunomide for any therapeutic purpose that might incidentally treat psoriasis an infringement of the Sanofi-Aventis patent, for an additional ten years (until 2014). The compound leflunomide itself was the subject of Australian Patent No. 529341, which expired in 2004. The specification of this patent indicates that leflunomide is useful as an antirheumatic, antiphlogistic, antipyretic and analgesic agent, and for the treatment of multiple sclerosis. Leflunomide was originally registered by Sanofi-Aventis on the Australian Register of Therapeutic Goods (ARTG) only as a treatment for active rheumatoid arthritis (RA). In July 2008 Apotex Pty Ltd obtained registration of its generic versions of leflunomide, named ‘Apo-Leflunomide’, on the ARTG, with the intention of marketing in Australia its generic leflunomide products for the treatment of PsA and RA, i.e. 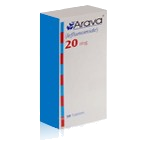 for the same purpose as Sanofi-Aventis was marketing ARAVA. Neither company has a registration on the ARTG covering the use of leflunomide for the specific purpose of treating psoriasis, as covered by claim 1 of the patent. Sanofi-Aventis commenced proceedings in the Federal Court, claiming that, by its proposed conduct in respect of the indication for PsA, Apotex threatened to infringe claim 1 of the patent. Sanofi-Aventis also claimed that by failing to warn customers that use of the generic product would result in patent infringement, Apotex was engaging in deceptive and misleading conduct, and additionally that Apotex had infringed its copyright in the product information document filed with its ARTG application. Apotex, in response, alleged that the patent claim was invalid for lack of novelty, lack of inventive step, for not being a ‘manner of manufacture’, lack of fair basis, lack of utility and/or insufficiency of description. We note in advance that all of these grounds failed. We will, however, discuss the novelty ground in greater detail below. The outcome of the case, particularly with regard to infringement and novelty, was critically dependent upon the construction and scope of the single claim. A method comprising the administration to a recipient of a pharmaceutical composition [containing leflunomide] by a medical practitioner who intends, by the administration, to prevent or treat psoriasis in the recipient. A method comprising the administration by a medical practitioner to a recipient of a pharmaceutical composition [containing leflunomide] where the “objective purpose” of the administration is to prevent or treat psoriasis in the recipient. A method comprising the administration by a medical practitioner to a recipient of a pharmaceutical composition [containing leflunomide] to prevent or treat the recipient’s psoriatic arthritis by which, incidentally, psoriasis will also be prevented or treated in the recipient. A method comprising the administration by a medical practitioner to a recipient of a pharmaceutical composition [containing leflunomide] where the effect of the administration in fact is to prevent or treat the recipient’s psoriasis. The first and second of these possibilities differ in that the first requires reference to the subjective intent of the medical practitioner (which the court considered to be contrary to the ‘objective doctrine of patent infringement’, at ), while the second refers to the practitioner’s objective intent. The third and fourth constructions differ in that the third treats any treatment of psoriasis as incidental to an ‘intended’ purpose of treating PsA (which is plainly not what the claim actually says), while the fourth takes as its touchstone the actual effect of treatment (regardless of intent). Apotex ultimately urged the second construction, which would essentially result in infringement only when leflunomide is prescribed specifically for treatment of psoriasis. Sanofi-Aventis favoured the fourth construction, which would result in infringement whenever the actual effect of administration of leflunomide is to prevent or treat psoriasis, regardless of the objective purpose for which it was originally prescribed. …the claim itself says nothing about the purpose of the administration of the compound. The method claimed is a method of preventing or treating the skin disorder psoriasis by administering an effective amount of the compound. The method is described and defined by the result: the prevention or treatment of psoriasis. … According to the specification, “prevention” is the prophylactic prevention of psoriasis in a susceptible mammal and “treatment” is arresting the development and retarding the progression of psoriasis in a susceptible mammal. … the particular disease, psoriasis, is an essential integer of the method claimed. But its essentiality operates in terms of result or effect (the fact of prevention or treatment of psoriasis) and not … in terms of the purpose of the administration. A number of items of prior art information were said by Apotex to deprive the claimed invention of novelty, including the original compound patent. None of the prior art documents taught that leflunomide was effective for the treatment of any disorders other than RA and multiple sclerosis. Certainly none taught that the compound could be used to treat psoriasis. On this basis, Sanofi-Aventis argued that the claim was novel. Apotex appealed (at ) to the ‘reverse infringement test’. The logic behind thins, given the court’s chosen claim construction, is compelling. If the administration of leflunomide, for any purpose, inherently results in treatment or prevention of psoriasis, and is thus an infringement of the claim (if valid), then the use of leflunomide before the priority date, for any purpose, must constitute an anticipation. To put this more directly, if the use of leflunomide to treat PsA after the priority date is an infringement of the claim, then exactly the same use before the priority date must be an anticipation. The court therefore considered that the key question, in relation to the original compound patent, was whether it actually taught the use of leflunomide to treat PsA. The court found, for a variety of reasons (at -), that it did not. The claim was therefore novel (at ). Actual infringement of the claim would occur only at the point of treatment. Sanofi-Aventis’ case against Apotex, as prospective supplier of the drug, was based upon indirect infringement under section 117 of the Patents Act 1990 (about which we recently wrote in Infringement By Supply of Products – Still Clear as Mud?). This was a case in which the plain meaning of section 117 seems to have been uncontroversially adopted. In particular, the threshold of subsection (1) was satisfied, because the use of a product (leflunomide) by a person (to treat PsA) would infringe the patent (by, in almost all cases, also treating or preventing psoriasis) (at ). The court further found that the ‘use’ in question satisfied at least section 117(2)(b), i.e. that the use would be, ‘if the product is not a staple commercial product – any use of the product, if the supplier had reason to believe that the person would put it to that use’. The product in question was not considered to be leflunomide generally, but in particular Apotex’s leflunomide product, which could only be supplied for the approved purposes identified on the ARTG, including treatment of PsA. This would result in the product being put to a use which would also treat or prevent psoriasis, thereby infringing the patent (at ). Therefore the court concluded that Apotex would infringe the patent, under the provisions of section 117. Each individual aspect of this decision appears to make sense on its own terms, but overall the outcome does not seem to be ‘right’. In particular, can it be the case that after expiry of the compound patent, Sanofi-Aventis may rightfully continue to enjoy the benefits of a monopoly on supplying leflunomide for treatment of RA and PsA on the basis of a patent that is sustained by the novelty of using the drug to treat psoriasis, when this is not even an approved use in Australia, and is not the specific object of prescribing the drug? This does not seem right. From a policy perspective, allowing patents to be validly granted in respect of second and subsequent medical uses of known compounds is justified as an economic incentive for drug companies to invest in identifying, or discovering, such additional uses, and following through with the necessary regulatory approval processes, which may all involve substantial time and cost. However, a new patent covering the new use is supposed to be sufficient reward. An effective extension of the monopoly in respect of old uses, which would otherwise be open to competition from generics, is an excessive reward, and imposes additional costs on society. And this is a particularly disturbing case, because the compound in question is not even approved, or being prescribed, for the new use covered by the patent claim! However, it is possible that the facts in this case are somewhat unusual. There does not appear to have been any evidence to suggest that leflunomide had been given to any human subjects with PsA and/or psoriasis before the priority date of the patent. Therefore, the assessment of novelty could not take into account any ‘inherent’ anticipation, but was limited to what the skilled person might have deduced simply from reading the prior art documents. In addition, there is a very close relationship between PsA and psoriasis, in that the latter is a known diagnostic criterion of the former. This sets the present case apart from a situation in which the later medical use is less intimately associated with the proposed purpose for which the drug is supplied. When leflunomide is prescribed for treatment of PsA it is, by definition, being given to patient who, in almost all case, will also have, or will be likely to develop, psoriasis. We therefore anticipate that this case will not provide a basis for any general ‘evergreening’ strategies. But we would also be extremely surprised if the decision is not appealed.